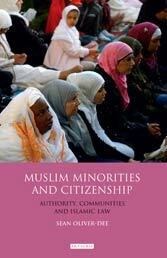 This November, Tauris Academic Studies will publish Muslim Minorities and Citizenship: Authority, Communities and Islamic Law by Sean Oliver-Dee (Associate Research Fellow, London School of Theology). The publisher’s description follows. The issues of citizenship, identity, and cohesion have rarely been as vital as they are today. Since the events of 9/11 and subsequent terrorist episodes in Bali, Madrid, London, and elsewhere, focus in this area has centered primarily upon Muslim minority communities living in the West. This book examines the question of citizenship and loyalty, drawing on the historical contexts of Muslim minorities living under British and French imperial rule in the nineteenth and twentieth centuries, and looks at how shari’a functioned within the context of imperial civil code. It draws important comparisons that are of immense relevance today, and engages with current debates about the compatibility of Islamic law with civil law in non-Islamic societies. Engaging with both Muslim minority and government perspectives, this is important reading for scholars, students, commentators, and policy-makers concerned with the question of Western engagement with its own minorities.